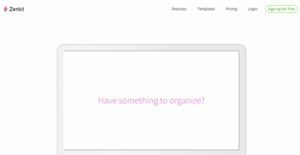 Zenkit is a project management application that is simple, user-friendly, and clutter-free. It is designed to simplify the way project managers handle all aspects of their projects, from task management, scheduling, resource allocation, budgeting, and reporting to name some. Zenkit is built to streamline all tasks, facilitate communication and collaboration between individuals and teams, and ensure that projects are delivered to the exact specifications of their clients. With ZenKit, users don’t have to struggle with a “one-size, fits all” software that only complicates things. It provides users with separate sets of tools and different views for specific tasks, enabling users to work more efficiently on the tasks they are assigned to, enhancing both individual and collective output which then leads to better overall productivity and results. Zenkit provides you with the right tools for your tasks and other specific functions. Why deal with tools and features that you don’t need for your work? With ZenKit, you have everything you need right from the get-go, enabling you to maximize the software’s potential and fully leverage it to streamline and simplify your tasks and help deliver results timely. When you have to deal with multiple projects, you need to have access to multiple views that tell you all the relevant data. With Zenkit’s My Calendar feature, all data you need are in one place. From schedules to progress to real-time project statuses. In a single glance, you have all the information you require to make smart business decisions. Communication to and among different individuals and teams can be quite chaotic, especially when you juggle multiple inboxes and switch from chat to email to SMS. ZenKit transforms your communication into an organized, seamless process by putting every work-related communication into a single, unified inbox. Communication and collaboration become simple and stress-free. Do you have a number of projects that you want to keep a close eye on? With ZenKit, you can mark these projects as your Favorites and you can track them effortlessly from one place. All activities are tracked in real-time. That means whenever you access data, view a report, or simply check what’s going in, you can be sure that what you are dealing with are the most recent activities. ZenKit integrates with Zapier, which means you can incorporate ZenKit into your existing workflows easily and quickly. There is no need to overhaul your entire system to make ZenKit work with your CRM, accounting systems, ERPs, and other software. Zenkit works with you right from the start, greatly impacting the way you manage, perform, and deliver your projects. What Problems Will Zenkit Solve? Kevin is a project manager. He and his team use X-Mind to better visualize brainstorming sessions with a mind map. For daily tasks, they use a combination of Wunderlist and Trello. They use an Excel Spreadsheet as a CRM and also for their budget. Lastly, for idea management they use Evernote. This might sound exaggerated, but it´s the day to day in many offices. Is this really what productivity should look like? Zenkit addresses the desire for project managers to become more effective and productive at managing and delivering their projects but ditch the use of multiple systems to get the job done. It is important to keep in mind that almost no app in the Project Management Software category will be an ideal solution that can match all the goals of different company types, sizes and industries. It may be a good idea to read a few Zenkit reviews first as specific solutions might excel just in a very narrow set of applications or be designed with a very specific industry in mind. Others can operate with an intention of being simple and intuitive and as a result lack complicated features desired by more experienced users. There are also services that support a broad group of users and offer a complex feature base, but this usually comes at a more significant cost of such a service. Make sure you're aware of your requirements so that you select a software that provides all the elements you search for. How Much Does Zenkit Cost? Zenkit offers the following SMB and enterprise pricing packages for users to choose from. Give the details a look, and select the best plan for your business. We realize that when you make a decision to buy Project Management Software it’s important not only to see how experts evaluate it in their reviews, but also to find out if the real people and companies that buy it are actually satisfied with the product. That’s why we’ve created our behavior-based Customer Satisfaction Algorithm™ that gathers customer reviews, comments and Zenkit reviews across a wide range of social media sites. The data is then presented in an easy to digest form showing how many people had positive and negative experience with Zenkit. With that information at hand you should be equipped to make an informed buying decision that you won’t regret. What are Zenkit pricing details? What integrations are available for Zenkit? Zenkit integrates with over 1,000 apps through Zapier. If you need more information about Zenkit or you simply have a question let us know what you need and we’ll forward your request directly to the vendor.